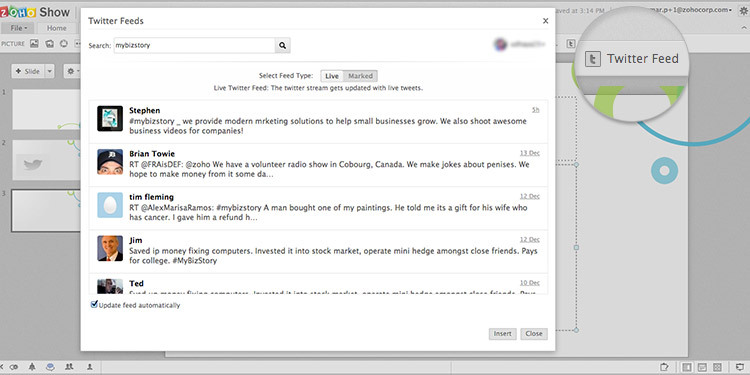 Introducing Zoho Show extension for Google Chrome. Take your Chrome experience to a whole new level. 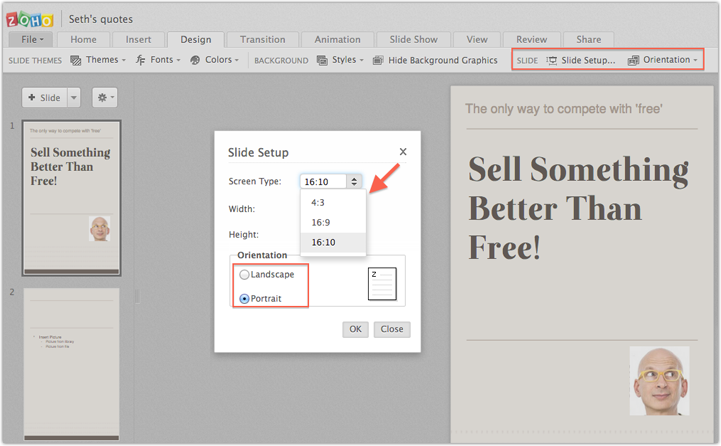 Download the Show extension to quickly draft up new ideas and convert them automatically into beautiful slides. The extension also lets you create, edit, import, and play all your favorite presentations—all in one place. Introducing Zoho Show app for iPhone, iPad, and Apple TV. 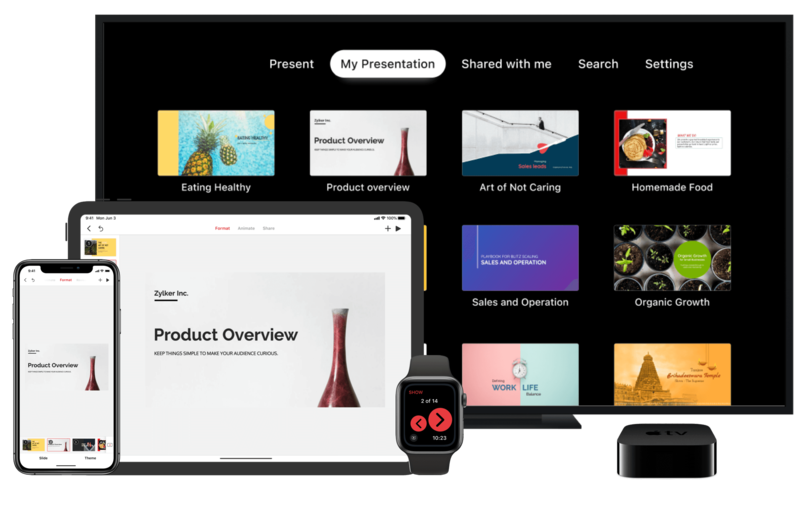 Start creating presentations on the web, access them on the go from your iPhone or iPad, and use the Zoho Show app for Apple TV to deliver your sessions on the big screen. 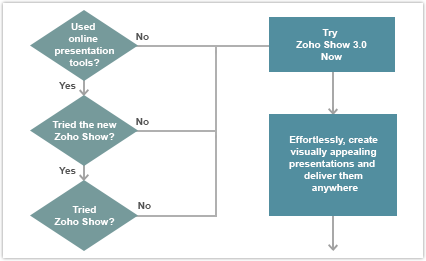 Introducing the next gen presentation tool - All new Zoho Show. Show’s clutter-free interface lets your ideas take the front seat. It now offers an intuitive formatting pane that responds to user actions, on top of more than 50 new features that help you design slides, work with your team, and deliver your session like a pro. Deliver your presentations using Android TV. Show has introduced an app to compliment the modern meeting room. Stream presentations on your Android TV without having to even connect a device. Carry your presentations on the go. 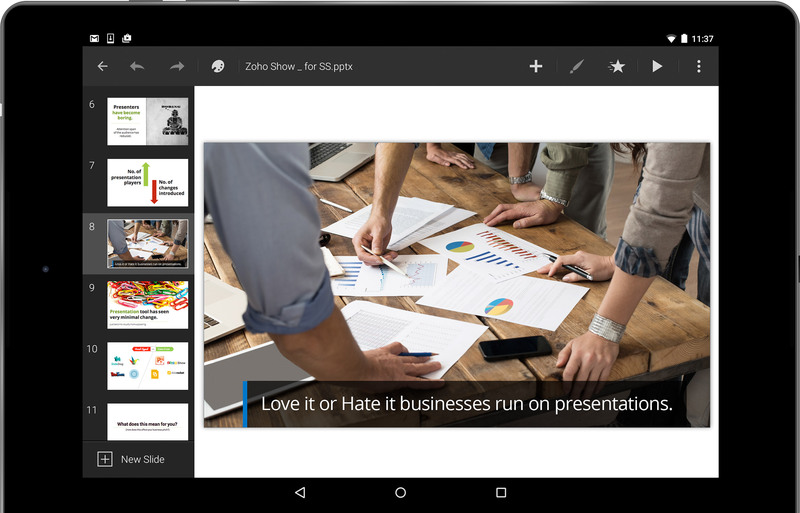 View, import, and deliver presentations right from your Android phone. The Show app for Android devices lets you access your slides from anywhere, at any time. Import, render and export charts with Zoho Show. Numbers and accounting data are often represented in the form of spreadsheets and tables. While this may seem detailed, it does not sit right within a presentation. Directly producing data to an audience is one thing, but how will you highlight an increase in trend or compare two different variables? Analysis is possible only when your numbers are expressed in the form of charts and graphs. With Zoho Show's latest update, all your charts and graphs are effectively reproduced. They are now shipped in their exact format without being converted into images. The next time you import/export your .ppt/.pptx files into Zoho Show, you will find the graphs, pie charts and other illustrations of the same quality. This includes their colors, texture and borders. Bar Charts - Compares data from different departments, giving a quick look at the highs and lows. Eg. While studying website traffic, expenditure by various teams, number of people in various ages groups for vaccination and more. Column Charts - These charts are oriented vertically. Eg. In periodic profit analysis, clustered forms of these charts can be used to compare the revenue generated in different years among different regions. Pie Charts - Shows the relative proportions(percentages) of collected data. Eg. To display percentage of budget alloted to different departments, percentage of how americans spend their vacation, breakdown of employees' nationality in the company. Doughnut Charts - Donuts might have more than one data series. Every ring in the donut represents a specific data. Eg. To plot the sales of a product in different locations for consecutive years, quarterly sales, internet users by millions in different countries. Area Charts - Ideal for explaining the magnitude variation between different data. Eg.To depict the export and import records between two nations. Line Charts - Simple way to visualize by connecting individual numeric data. Eg. To display webpage views and company growth. Scatter Charts - Gives you an idea of trends and concentrations which will direct your focus. Eg. Reveal the height and weight of individuals based on gender. Bubble Charts - Varied size about the bubbles depict the data. Eg. Class attendance, country wise policies are displayed. Note: Editing and creating new charts will be available soon. The power of touch - create, edit, and share your presentation. 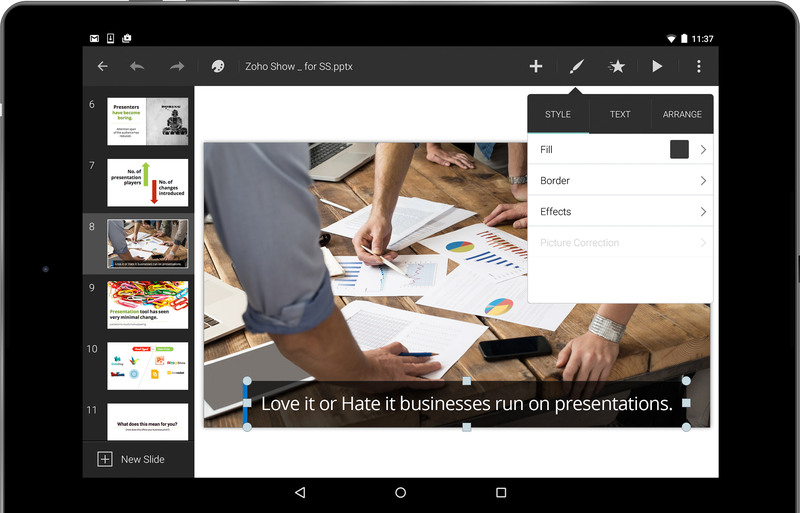 Edit your slides on your iPad and Android tablet with the updated Zoho Docs Presentation app. 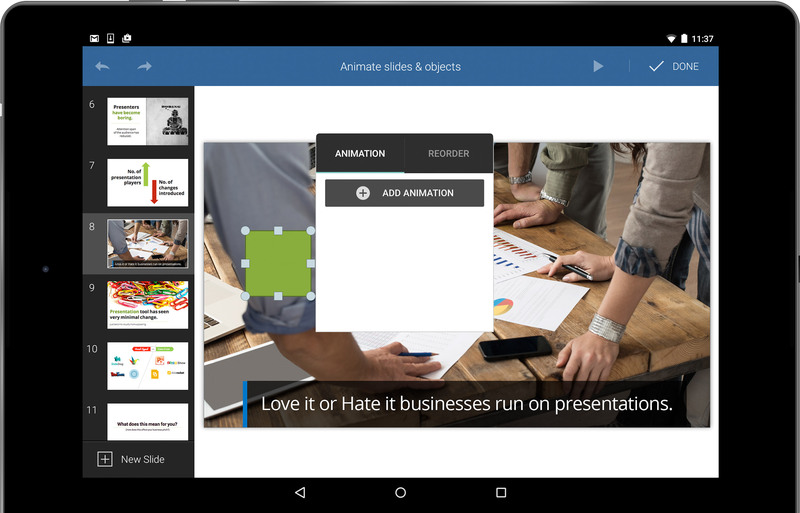 Tap on your device to create presentations, edit existing ones, add attractive images, and insert animations. 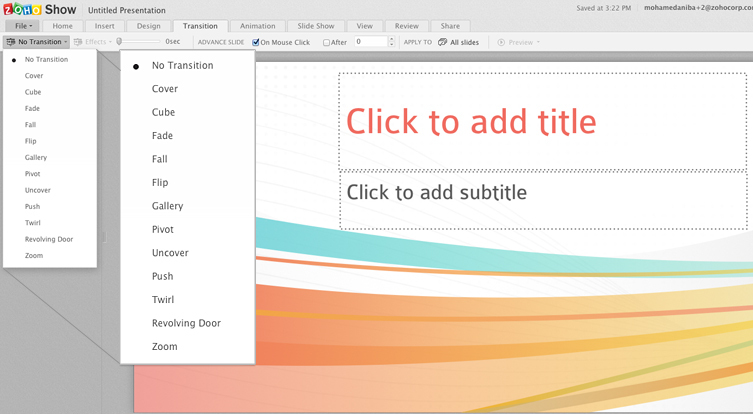 The user-friendly visual editor makes your life easier. Select the object (i.e. text, image, or shape) and all its functions will appear on the user panel. 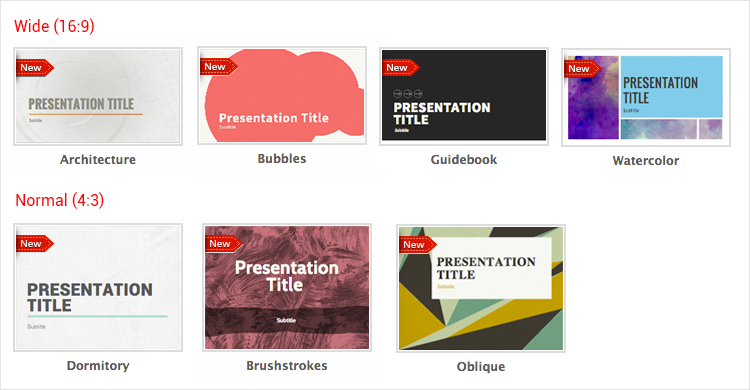 Create and edit stunning presentations. The app gives you themes that let you display your content with visual diversity. 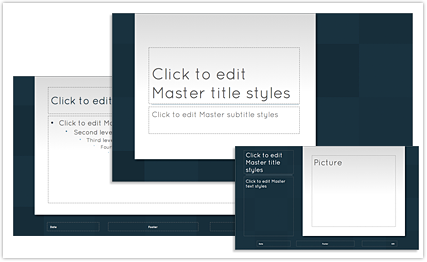 These themes control the colors, fonts, effects, and background styles of all the slides in your presentation. Combine themes, layouts, shapes, charts, pictures, etc. to tell your story. Click and fit into the slide. Notice an impressive image for your presentation? No need to search for a similar image on the internet or your computer any longer. Just click a photo with your camera in your iPad or tablet, and insert it in your slide. You can also use images from Flickr. Transcribe as you talk - voice recognition. Instead of typing on your device, speak to it; what you dictate will display on your screen, saving you time. Don't worry if you can't find images or clip art to represent exactly what you want. With the editor app, you can draw your own. 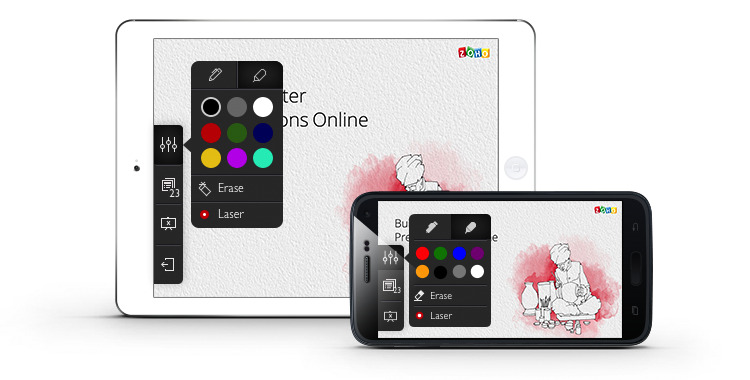 Draw an object from scratch using a slide pen, or even your finger, on your iPad or tablet. You can also add formatting effects to your freehand object, including resizing, rotating, changing the colors of the shapes, and 3D effects such as shadows. Draw your audience's attention to important sections without your slide pen. Just place your fingertip on the area to emphasize a point, and it will automatically reflect on the screen. Even the driest of topics become intriguing when they have some animation. Your slides will look dynamic because you can twist and turn the images and text. It's also a great way to make your presentation dramatic by revealing items one step at a time. Work the way you want to. Because your slides are saved on the cloud, you can collaborate as much as you like with your co-workers on the most recent version. You never know when you might need to turn that collaboration into an impromptu performance. The app lets you give your presentation, no matter where you are. The slide decks can be accessed on any desktop, tablet, or phone; embed them within your site or blog. Those spelling mistakes - never again! Imagine this. You are in front of an audience presenting an impressive slide deck. Suddenly, a few misspelled words appear on the screen. It's not that you don't know how to spell the word, it's that you were rushing to get your thought out. Either way, presenting those misspelled slides to your audience is a nightmare. 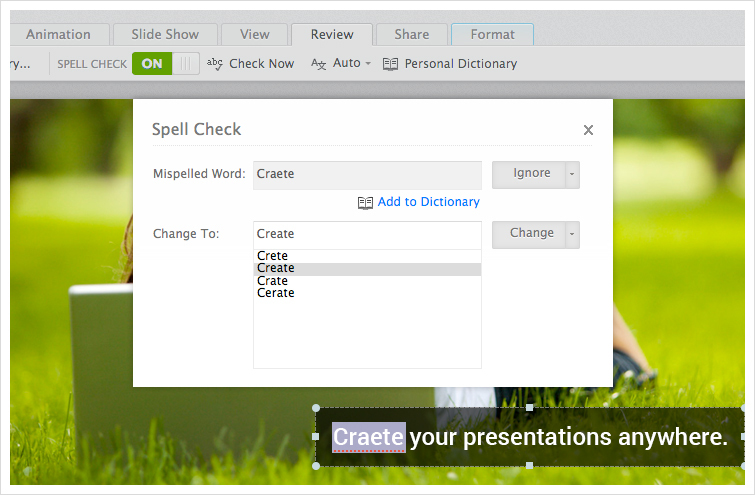 Now, Zoho Show gives you the Auto Spell Check option. By default, the Spell Check feature checks the spelling for you; make your ideas flow without worrying about minor errors. Check Now - Spell Check reviews the entire document and detects the misspelled words, underlining them in red as you type. You can choose one of the suggested words from the suggestion list and replace it. Supporting Languages - Spell Check detects a total of 87 languages. It also provides six versions of the English language, distinguished by region. Your Own Dictionary - Like that catchy word and want to use it again in your document? Add it to your dictionary using the Personal Dictionary in Zoho Show. 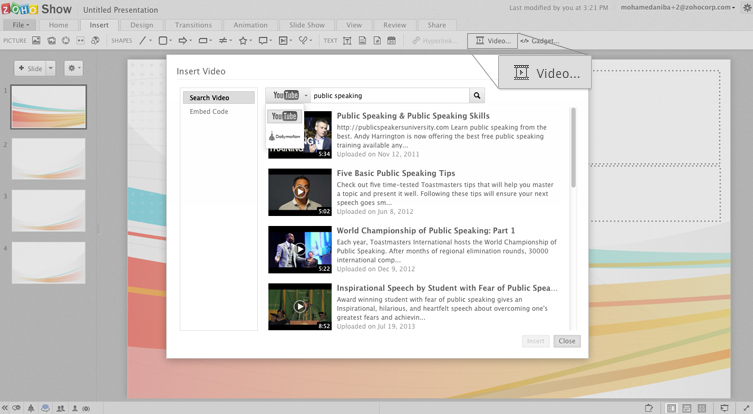 Zoho Show now lets your participants download presentations that have been broadcasted or published. The slideshow can be saved as either PPTX or PDF files. And it doesn't end here! 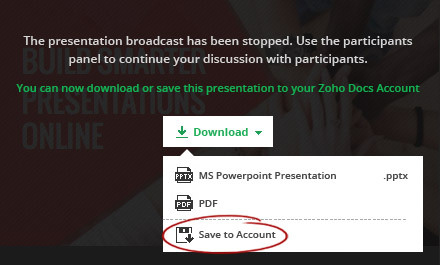 Your participants also have the option of saving the presentation to their Zoho Show account directly. When was the last time you wanted to print just a few selected slides? Or a hard copy of your slide notes to help you with your presentation delivery? Zoho Show now lets you print.. 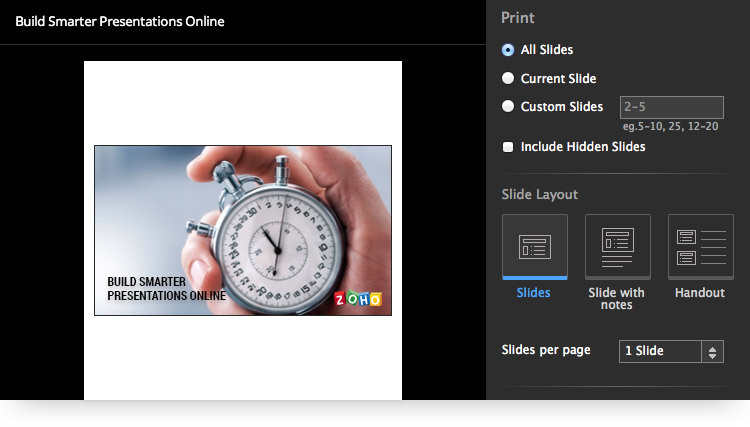 Multiple Slides - Print 1, 2, 3, 4, 6 or 9 slides on a single page. Slides with notes - Have one or two slides printed along with respective slide notes. Handouts - Printouts of individual slides, with space for the audience to take notes. Where did the Spinner go ? Faster slideshow loading. Presentations in general take time to load. It's worse if the presenter is in a hurry. Think about the last time you needed to load a presentation, and all you could see was the spinner that delayed it a few seconds. Well, not anymore! This update of Zoho Show ensures the disappearance of the spinner. This means your slideshows will load in a snap, without even a two second delay! It's quicker and you can save your work in a jiffy. Work on your presentations with ease and speed without worrying about any waiting time. 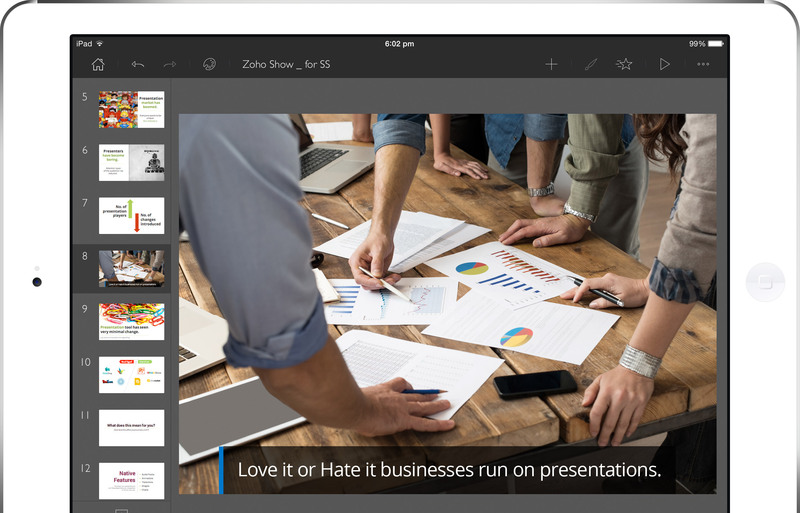 Zoho Show gives you the new and improved presentation broadcasting user interface. It is so simple and clear that it makes navigating a breeze. And not just that. It is also equipped with a Timer and the Blackout feature that helps you focus your audience's attention as required. And for the participants? 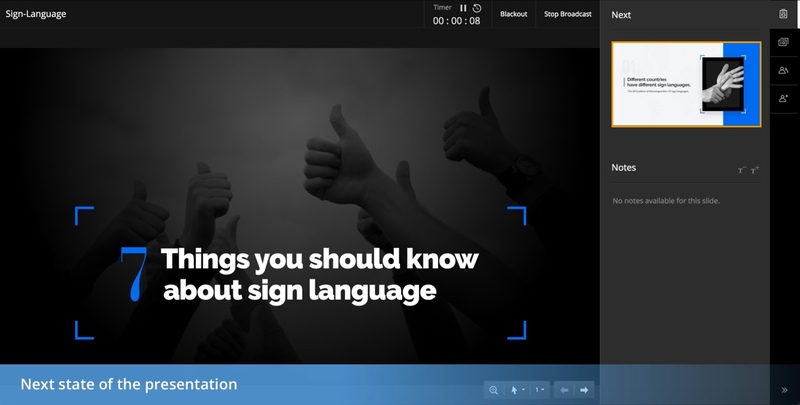 Your audience can now go through the already broadcasted slides, and have the option to 'Get-In-Sync' with the broadcast session whenever ready. Next state of the presentation and the presenter's notes. Thumbnail list of the whole presentation allowing the presenter to jump between slides. Invite Participants Panel : A Panel to invite users to the broadcast session. Participant's panel: A panel where participants can engage in discussions. Collaboration and working together can create magic! 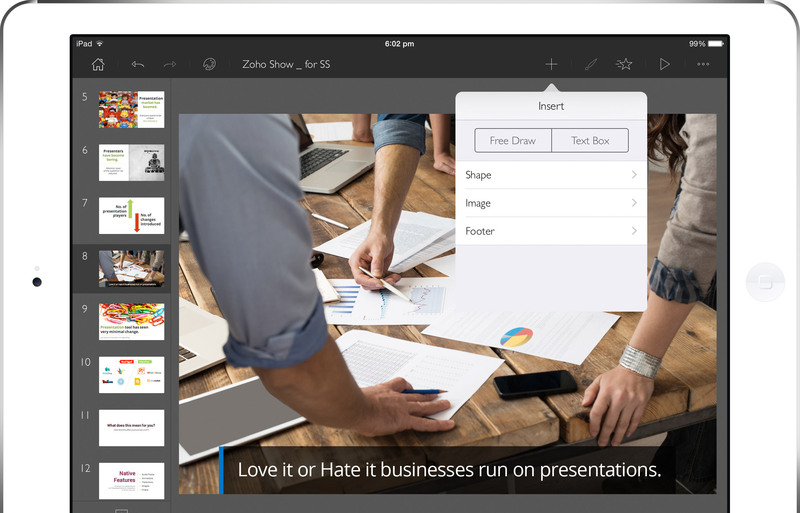 Using Zoho Show all shared users can now broadcast a single presentation. 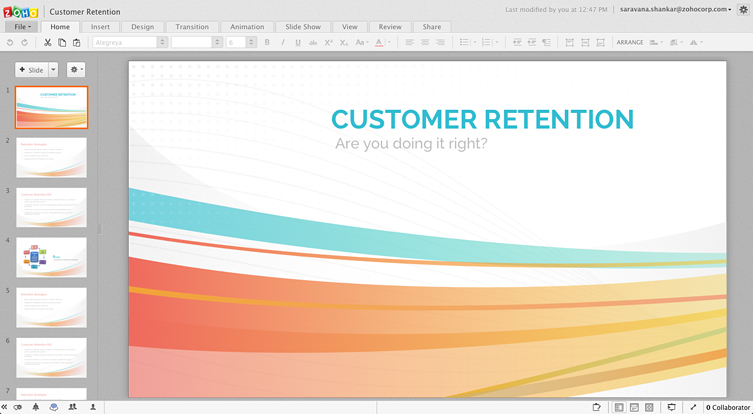 Zoho Show now gives you more character bullets to visually enhance your presentations . We've hand-picked the characters that will be the most useful for a presenter. However, you are free to select what's relevant to you from the many character options that we have now provided. The characters have also been categorized, to help you choose and use them easily. 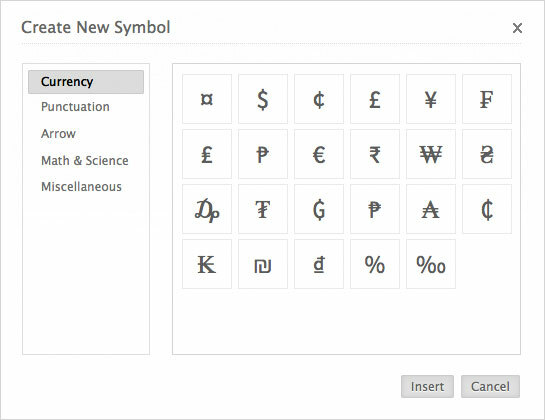 Coming soon: Symbols can be directly inserted into the document. No more static, non-interactive slideshows. You can now make an impact by delivering presentations with the redesigned and more interactive user interface. Express and emphasize your content by using the pen/highlighter feature. Blackout your screen to refocus your audience's attention on you. Convey your ideas creatively using animations and transitions. Stay amazed, there's lot more to come! Image library for Zoho Show. When was the last time you wanted to use an image for your presentation but couldn't locate it with ease because you have a pile of images to browse through in your 'Download' folder? Most of us would have come across this situation. We realized that the task of managing images was getting tougher for presentation software users. Not anymore! Introducing Zoho show image library. The Zoho Show image library is tightly integrated with Zoho Docs, and lets you search for an image, sort and pick images that you had downloaded earlier or access images that were just shared with you by your collaborators. This saves you a lot of time and effort, otherwise lost searching images scrambled across various drives in your computer. 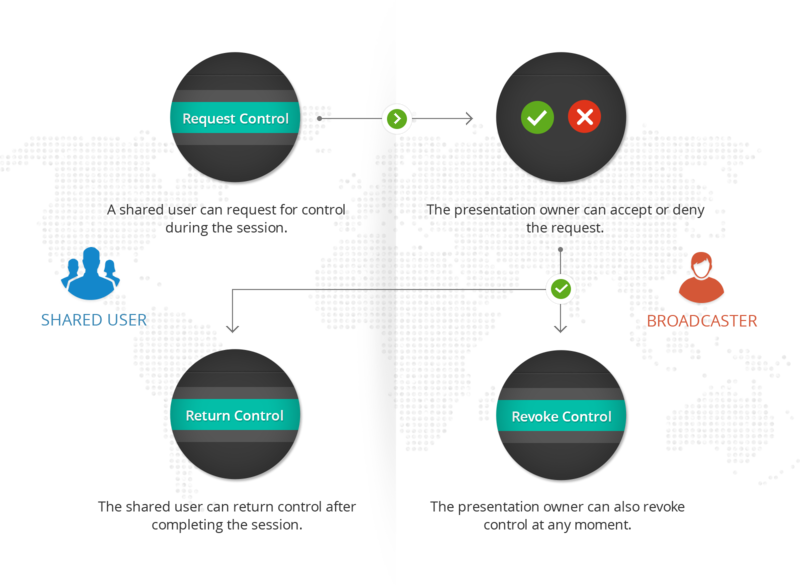 Document import and associated incompatibility issues have always been a nightmare for users. The threat of losing the accuracy and exactness maintained in a formatted document kept users away from trying more powerful alternatives to PowerPoint. But here's a reason to smile and take the big leap to Zoho Show! 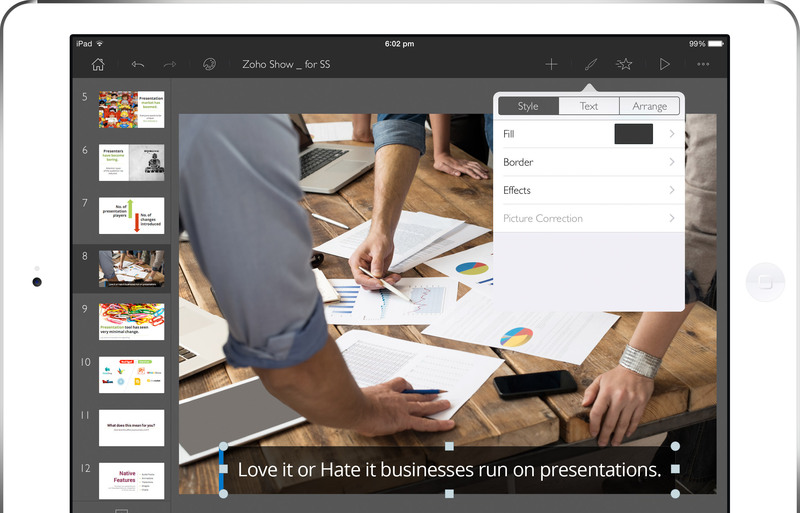 Zoho Show now supports hassle free import of your PowerPoint document! Especially your painfully crafted tables, rich with numbers and images!! This import ensures that you can view your document in the very same format as it was created - no faulty margins, misplaced numbers or unruly images! Presently, the tables that are imported can only be 'viewed' by users. The 'edit' feature is on its way and we will keep you posted about it. Presenter View - A presenter's greatest asset. 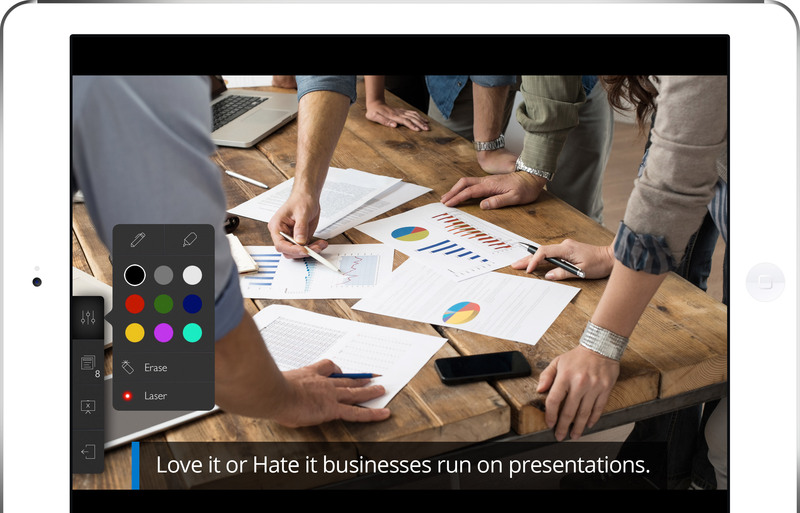 Presenter view enables you to see what the audience is viewing on the screen, while also having an extended version of the presentation open on your laptop. This means, as a presenter you no longer have to depend on the same slides duplicated on two screens. You have access to elaborate slide content and a set of other tools that makes presentations effortless. With Presenter View, you can view notes privately, keep track of the elapsed time,use slide pen to highlight content, zoom into convey ideas better, and blacken screen to refocus your audience's attention on you. All that needs to be done is to configure the laptop to run two screen simultaneously - the laptop screen for you (the presenter) and the projector screen for your audience. Edit text in grouped objects. The 'Group objects' feature helps us bundle together individual images,shapes,charts or text boxes for easy movement during any editing activity. However, editing text within a grouped object still remains a challenge to most of us. With the new update, you can edit texts in any grouped object, effortlessly. This helps you save a lot of time otherwise lost in the tiring process of ungrouping objects, then editing the text and finally selecting multiple objects to group them back together. Bring in more clarity with Zoom. If your text rich presentation with bullet points get monotonous, 'Zoom' is the perfect feature to get back your audience attention. A presenter can now provide a bird's eye view of any topic and then zoom into a particular point in the slide, using the Zoom tool, to elaborate the idea. Such a presentation would follow a non linear format where each relevant point on the slide is clickable and lets you zoom in further, unraveling a story step by step. The tool also comes handy when presenters address a big gathering and it is often difficult for the audience at the back or at the corners to view slides clearly. This particularly applies for slides with detailed content, charts, graphs, or images that require a closer look.The dynamic zoom tool will help you zoom in deep into a content and back to the original view, smooth and easy. Handle multiple slides in a breeze. Content editing in presentations would most often require us to move slides to a location within the presentation or to another presentation. Copying and pasting one slide at a time could be a torturous exercise if there area lot of slides. The multiple slide selection feature lets you select and move or sort slides in one go rather than repeating the process a number of times. All that needs to be done is to select the required slides and then copy, cut or drag the files to the suitable destination. If the slides are moved to a new presentation, it would inherit the theme of the slides that precedes it at the destination. Organizing Presentations - Made Easy! Forget going back and forth to the Zoho Docs screen just to move your presentation from one folder to another. 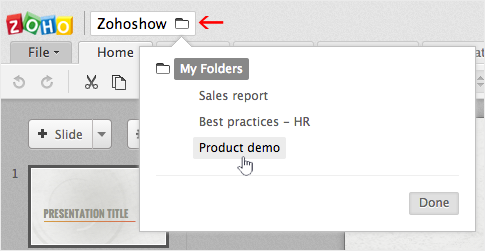 With this update, we have added the feature to shift folders right from the presentation editor. All you need to do is, from the document title section, select the folder to which you want to move the file, and click done! Your presentation is moved. With the new grouping feature available for shapes, the animations option has also been enabled for all your grouped objects. So not only you can group your shapes, you can also add animations to it and impress your audience. Once the objects are grouped, the animation applies to the complete block, leaving you the pain of applying it individually to each shape. So start creating designs and animate your way through. If you think your presentation looks a bit tame and needs a fresh look, we have the right theme for you. With a more professional, elegant, and classy look, this update we have eight new themes added to the list. So get the new look, and gear up to show off! Imagine adding a shape and filling in textures, formatting styles and effects for each one individually! Too much of pain? Save time, and make your work easier by grouping your shapes together to create unique designs, and format them without going one at a time. You can now share all your presentations in a safe and secure way. Be the owner of your own content, and restrict your collaborators to edit your work. With the new lock feature, you can lock a shape or a complete slide, restricting collaborators to make any further changes. Once locked, the content can't be edited by anyone and that includes the presentation owner as well. Just click to unlock the particular shape or slide to make any changes. Now avoid multiple clicks to adjust the line spacing for your content, as we bring the line spacing option right at your toolbar. Seeing the frequent need of using the line spacing option in presentations, we have now brought line spacing to the toolbar under Home tab, making it easier and faster for the user to edit the content. So just select your text, choose your option, and get perfectly spaced texts. Zoho Docs presentation provides a check-in/check-out feature that allows only one person to work on the document at one time. The Check-in / Check-out function, is very helpful in a collaborative environment as it prevents team members from overwriting each others changes. We now support embeds from the following websites as well. Zoho Show now sports a fresh look with the new gray interface that looks more neat and professional. You will find the menu tabs well organized with feature sets smartly grouped under each tab. The new UI also aims to provide a consistent user experience across other document editors within Zoho Docs. 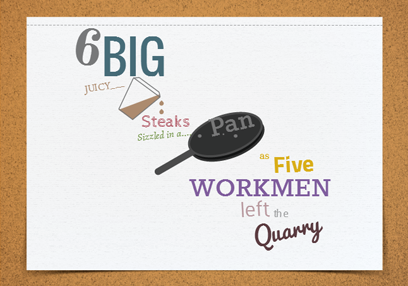 Animations and Transitions are a great way to make your presentations more engaging. When used wisely, they can even act as a powerful aid to visually communicate more complex ideas simple. Here is an opportunity to choose from a wider gallery of animation and transition effects, with many new styles to spice up your presentation. Once you have inserted a picture or a shape, you'd want to add effects to make it more prominent. Shadow, reflection or gradient and texture fills are few of the most popular effects that you can choose to emphasize an object on a slide. 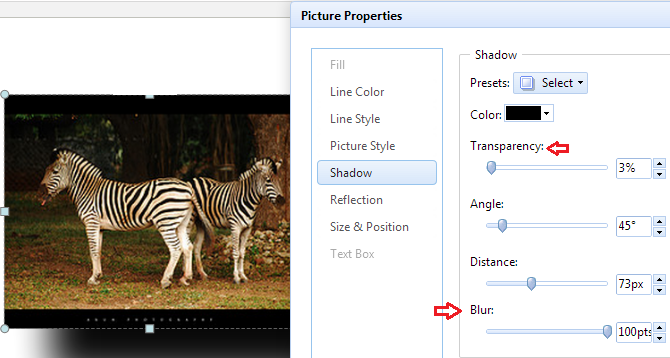 To make it easier for you, we have added Picture and Shape presets under the respective formatting tabs. Just pick one from the readily available built-in variations and keep building your slide deck. Wondering where the Style tab meant for picture and shape formatting has gone? Well, we've trashed it just to make it better. Now you'll find the tab only when you actually need them. Click on the shape or a picture and you'll see the format tab right there on the menu. All this while, you were allowed to share your presentations only with people who have registered with Zoho. This update, we have made it more flexible by letting you share presentations to non-zoho users, that is, with people who have not registered with Zoho. When you choose Anyone with the link, a link is automatically generated which you can share through email to specific audience. Co-authoring a presentation has always been easy and effective with simple file sharing, real-time edit views and live chat functionality. This update, we have made it even better with the live edit notifications. You will now be able to see who is editing the presentation and exactly where they are working in a document. A part of the content will be highlighted and marked with the name of the person who is currently editing the presentation. Aligning objects on a slide just got easy with smart guides. Smart guides are the dotted lines that appear default, when you try to position an object on a slide. The smart guides will come in handy when you are aligning multiple objects in a context, for instance; while creating flowcharts and diagrams. You can also extend the usage of smart guides to images, text boxes and media files. 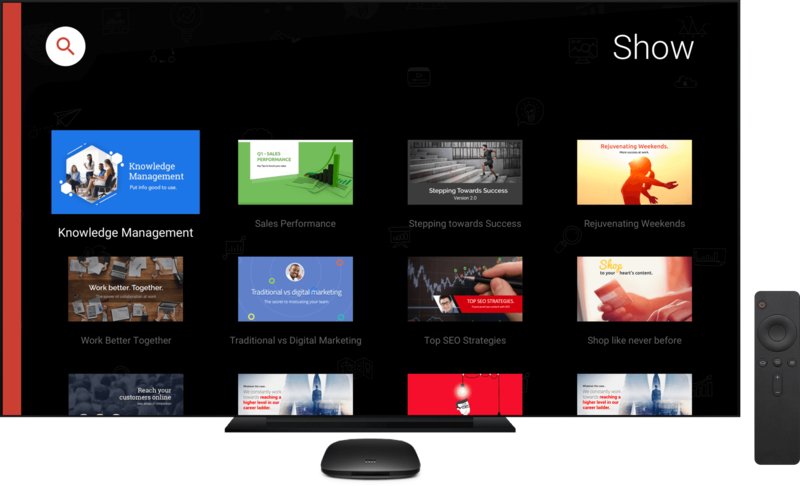 Big screen presentations are now possible with Zoho Show. The new set of themes is specifically built for the widescreen aspect ratio of 16:9. Your slides will be less cluttered, as there is more room for the content. 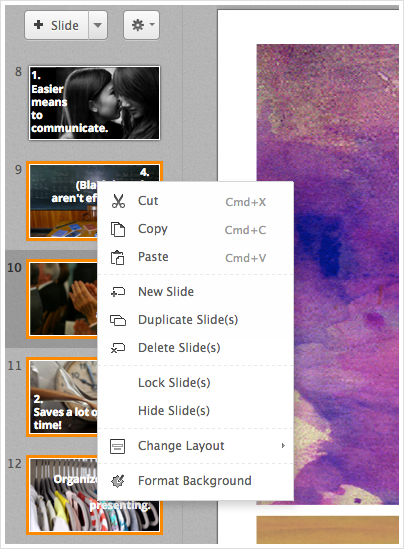 Adding images to your presentation just got easy with the new picture placeholder support. 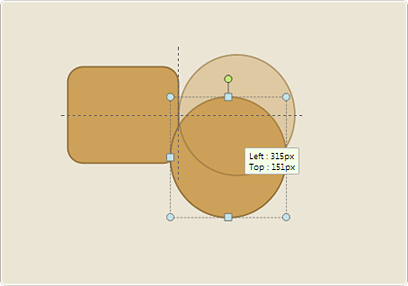 You can now fit images into one of the pre-designed shapes, while maintaining a consistent style and position. Image re-sizing and cropping is made simple and painless. We seldom realize that fonts can actually make or break the overall effectiveness of a presentation. Wise choice of fonts can help you create powerful visual content that is highly engaging. This release, we have added around 20 new web fonts. Sure, there is lot more to come. Themes are merely not a design for presentation template; this is where first impressions are formed. Be it a casual presentation or a very formal business meet, the new themes are just perfect for all the occasions. Each theme looks unique; with a clean and recognizable layout, fresh color scheme, and minimal design that gives a lot of scope for your content. A gradient is a gradual blend of two or more colors or slight variations of the same color. Gradients can be used to modify shapes or to create compelling slide backgrounds. There are basically two types of gradients - linear and radial. We have been supporting linear gradients for quite some time now, and this release you can see the radial gradients in action too. The transition of colors takes a circular path in radial gradient and these are predominantly used to add effects on circular objects. 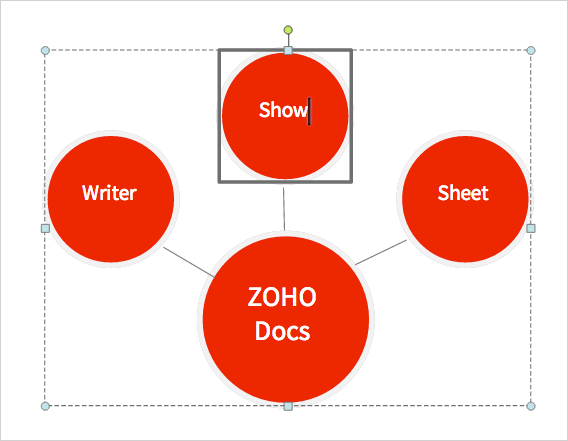 Zoho Docs provides a centralized UI for Writer, Sheet and Show documents. All the documents you create in Zoho Writer, Sheet and Show are stored in Zoho Docs by default. 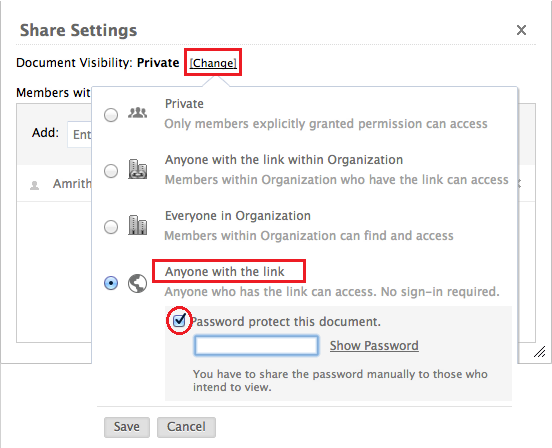 Previously the Zoho Writer, Sheet, Show documents, were accessible from their respective urls. Now they will be accessible from one common URL, making accessibility to these apps easier. 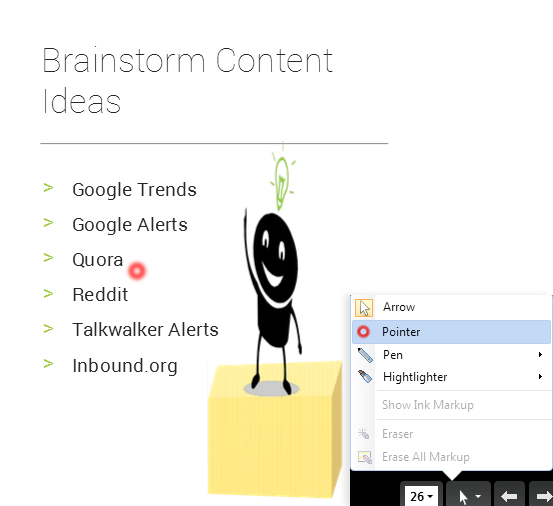 First Draft - Create Presentations On The Go! Create presentations on your iPhone as and when you get ideas. Sync presentations to the Zoho cloud when you login next. Learn more. This update, we have taken efforts to improve the overall performance of your presentation editor. Slides once rendered, will never re-render again. You can see this evidently while resizing the thumbnail area and also while zooming in the editor area. Slide shows will load and render faster. There are unique ways to set the tone of the images that you add to your slides. Create that desired tone using shadow blur and transparency effects. A shared presentation in slide show mode will now show the slide number and slide notes. It’s just not the content on the slide, you can share lot more related information through slide notes. Looking to add some nice images to your presentation? Search it directly from the web, actually without leaving the editor. You just have to type the keywords there to find the relevant images. 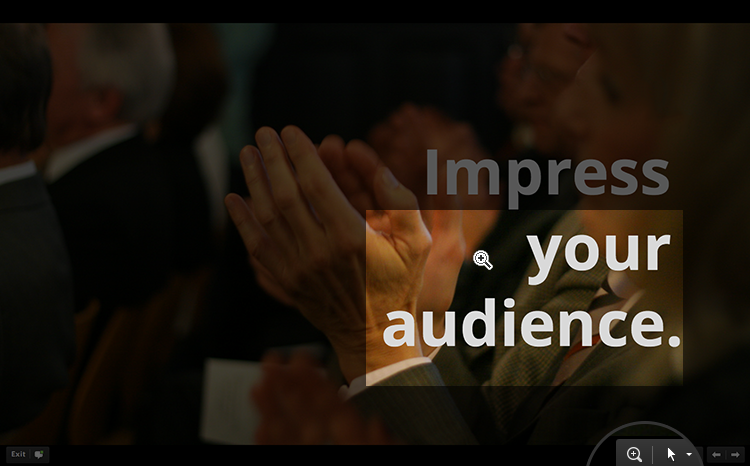 Make your presentations social. Sharing on Facebook And LinkedIn is just a click away. Quickly mold images into one of the pre-defined shapes. You will get to see your images beautifully transforming into interesting shapes. The embed toolbar now sports a nicer look and feel. We have refined and improved the embed options further. You'll now be able to easily get a custom embed code for your presentations. 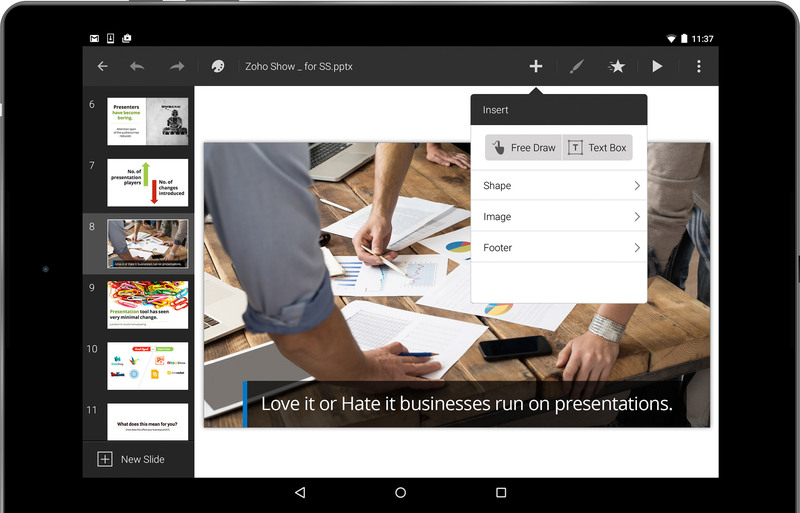 With Zoho Docs android app, you can view presentations on the go. Though editing a presentation is not possible now, we will soon be supporting it. 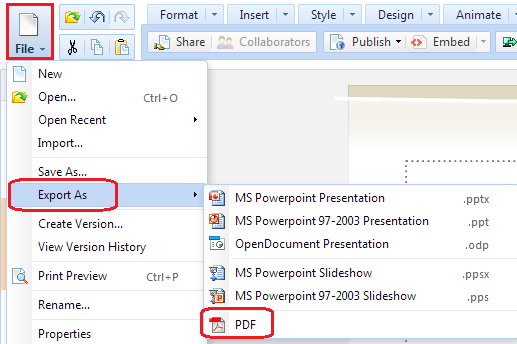 You can now export your presentations as PDF documents. To help you deliver engaging remote presentations, we have been adding several functionalities to remote broadcasting feature and this time it is the laser pointer and the text and shape animation that makes it to the list. 01. While presenting virtually, laser pointer helps you to draw audience's attention to specific data points and keep them engaged. 02. You can see the shapes and paragraph on the slide getting animated on double click. 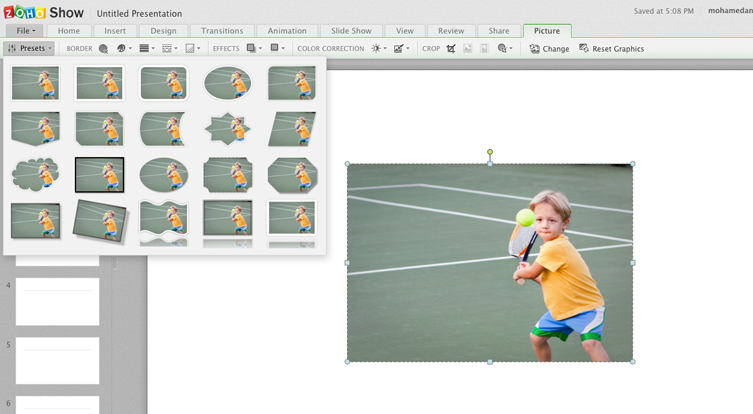 Slide orientation in Zoho Show allows the presenter to create slides in Landscape and Portrait modes. Portrait slides opens up doors to creative opportunities helping a presenter to think beyond the run-of-the-mill presentations. Landscape slide layout is seen default and it can easily be changed to portrait mode when needed. The Slide Setup menu also gives the presenter an option to choose from different screen types: 4:3, 16:9 and 16:10. Connectors are the lines that are used to connect shapes and they stay connected even when you move the shapes around. Creating flowcharts and diagrams is now easy with these self-routed connectors. 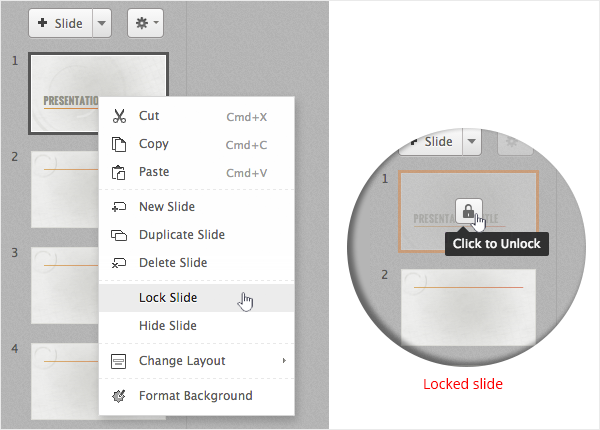 Master slide helps you to make changes to all the slides at a go. You can set text formatting, slide background, slide themes in a master slide that gets applied to all the other slides in a presentation. 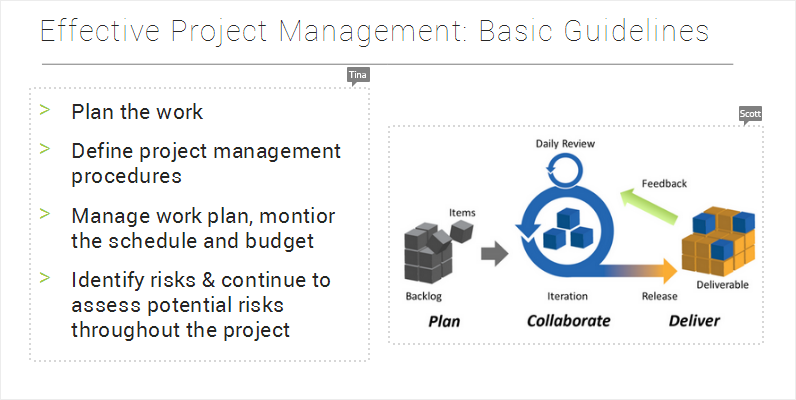 Every presentation has a master slide with corresponding layouts beneath it. 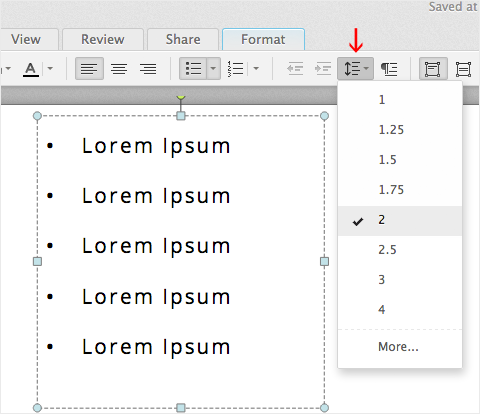 You can insert or duplicate a specific type of layout. 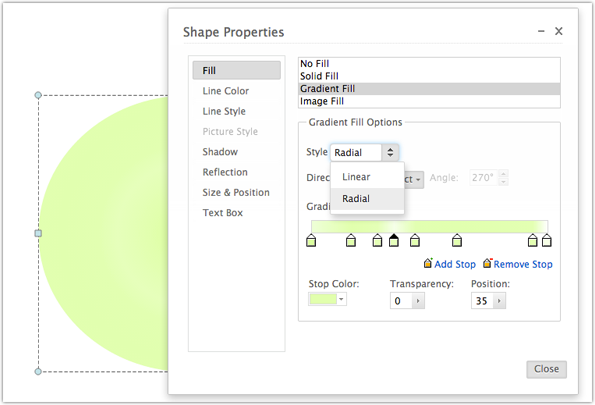 Zoho Show also allows you to customize the available layouts. 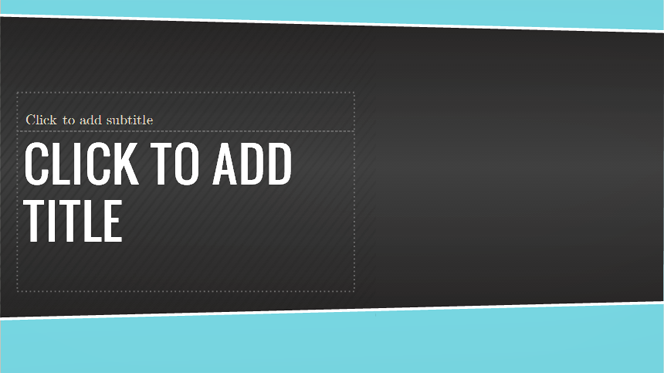 You can do this by adding placeholders specifically for content, text and picture. We are excited to launch the new, improved version Zoho Show 3.0 that promises to deliver the best experience of creating and delivering presentations online. 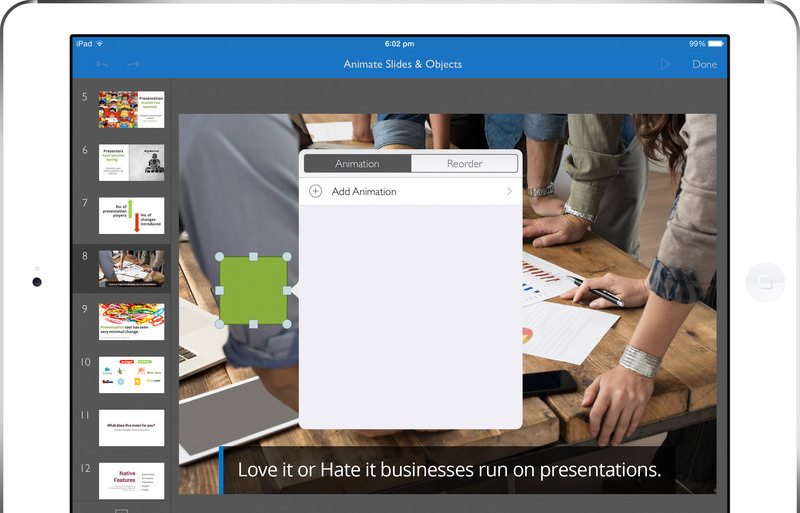 You can now take your presentations wherever you go, apply new ideas instantly, review, edit, share and deliver presentations on the go. 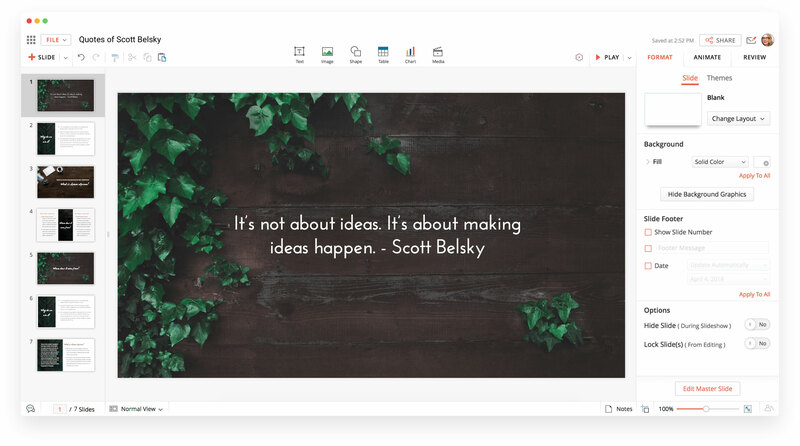 We are happy to announce the beta release of Zoho Show 3.0, the newest version that lets you create visually appealing presentations and deliver them anywhere and anytime. It's a complete make-over, click through the presentation below to see what's in store for you.